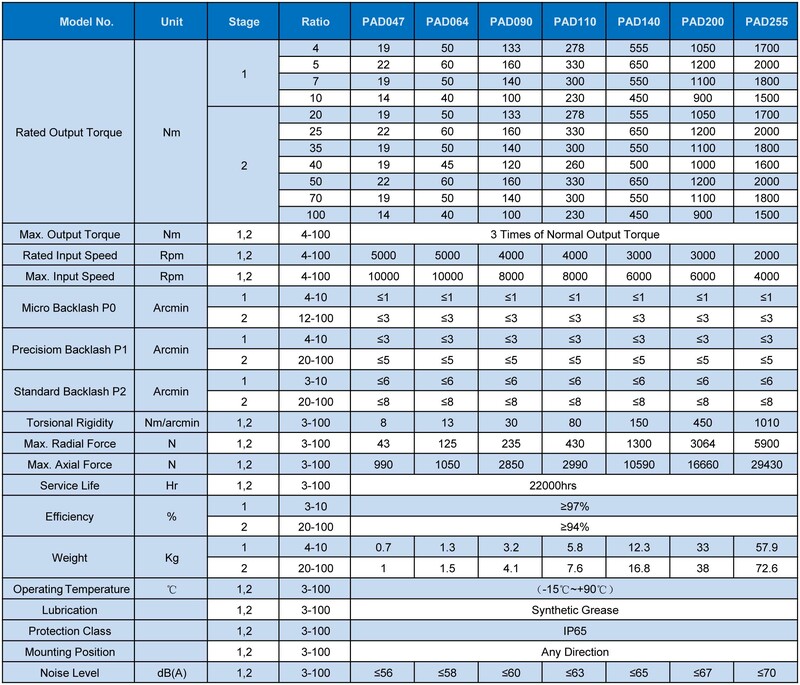 Tapered needle roller bearing is adopted to achieve the excellent load capacity of gearbox. 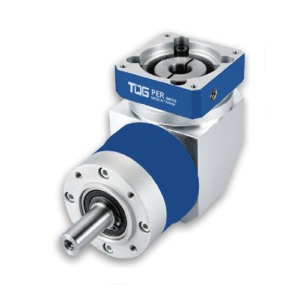 Planetary gearbox with method of flange and connector can be installed on any brand of motor in the market. 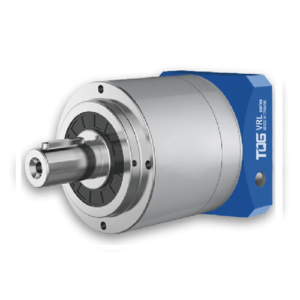 Taiqi PAD series speed reducer is a kind of flange mount high precision low backlash planetary gearbox with a hollow shaft output, which guarantees a dynamic performance in the running process and are widely used for motion control for different application. 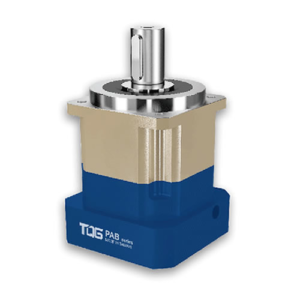 PAD planetary gearbox features a higher positioning, which is particularly suitable for high positioning precision, dynamic cyclic operations and compact solutions for motion control, automation, and robotic. Highest torsional stiffness, tilting moment and compactness are main characteristic of this excellent product. 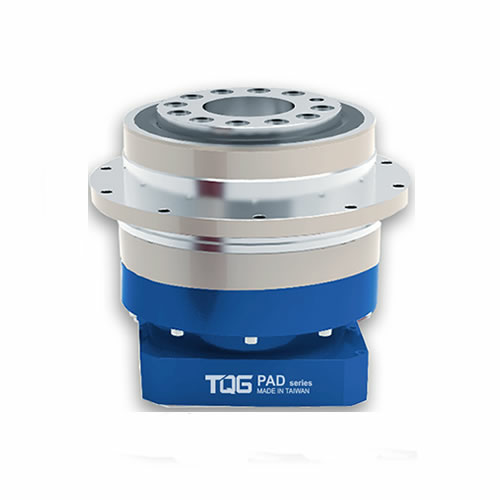 The PAD planetary gearbox features of higher positioning accuracy with higher torsional stiffness, higher torque and more compactness, which offers a perfect solution for dynamic cycle operation, motion control, automation and robotic. 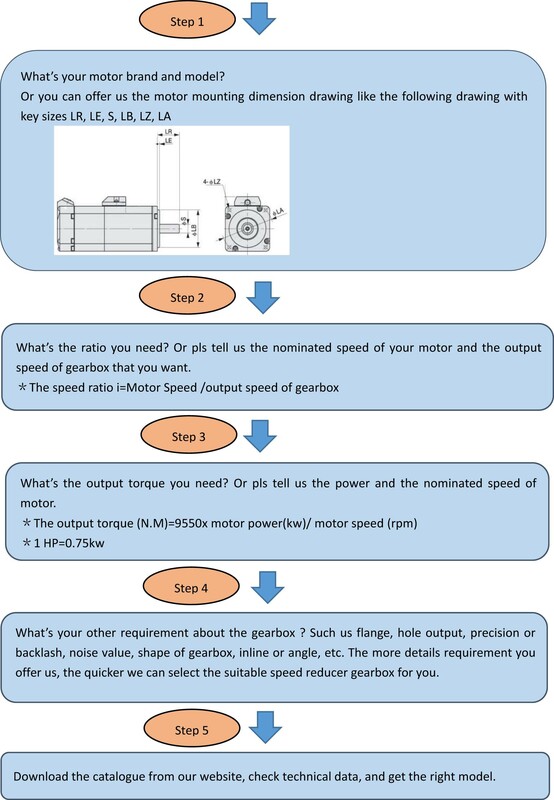 The gearbox input dimensions are varied depending on the motors installed. The input will be configured and shipped according to customer requirements. 1. 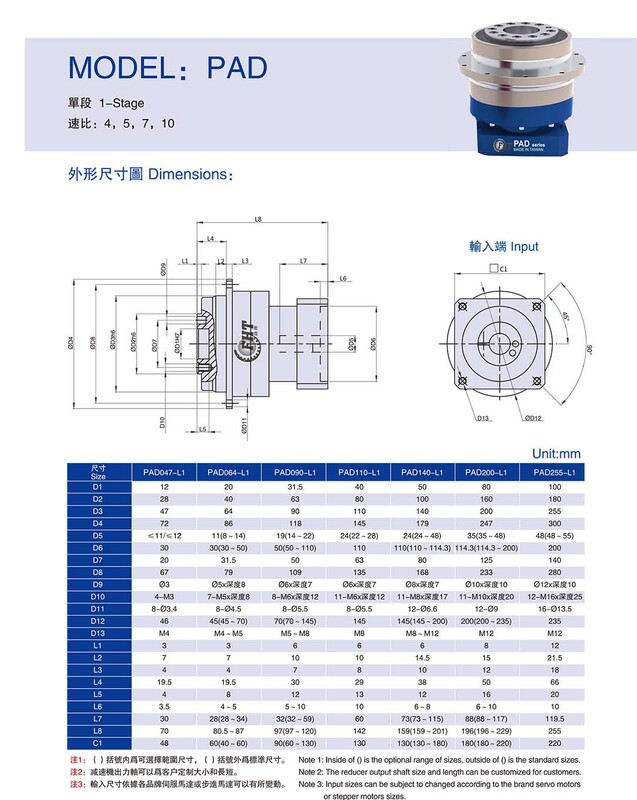 When the diameter of the motor shaft is different from the input shaft diameter, it can be used with the shaft sleeve. 2. 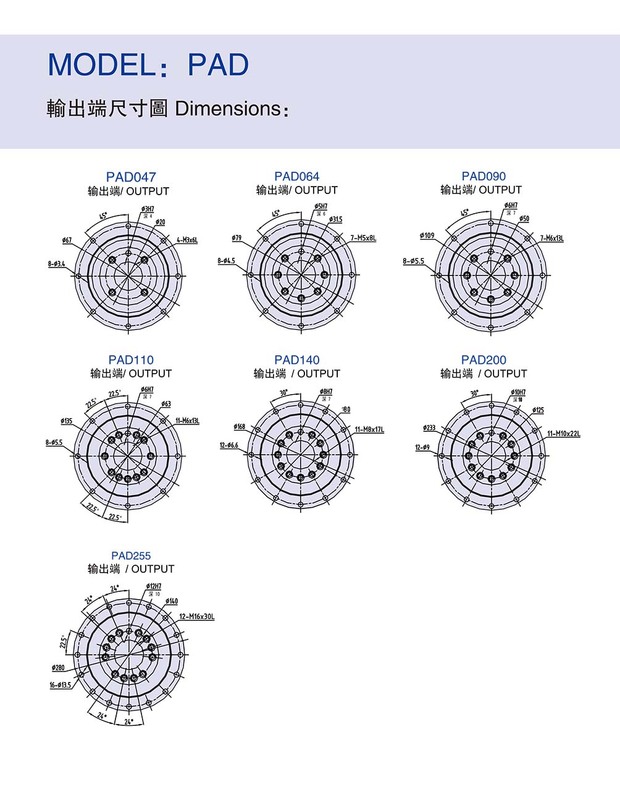 PAD planetary gearbox can be used with different brands of servo motors and stepper motors like Panasonic,Mitsubishi, Yaskawa, Taida, Fuji, etc. 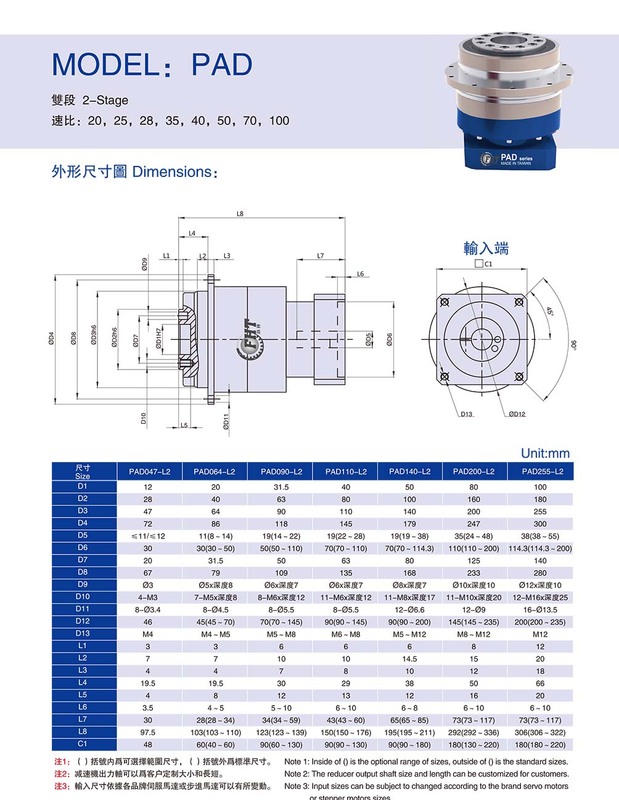 This PAD planetary reducers has been generally applied in fields of machine tools, industrial robots arm, loader robots, printing machines, medical equipment, measuring equipment, gantry robots, automotive industry, sealing machines, etc.